To connect your Android device to your Windows PC, you need to install a USB driver for your device. 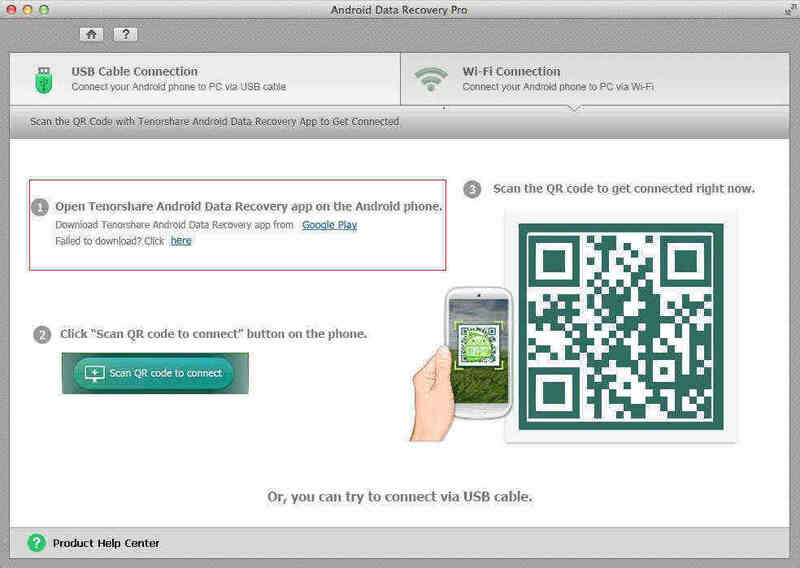 It is also a must step if you need to use Android data recovery to recover data from Android phones and tablets. So, we provide package, from which you can directly install the appropriate USB driver for your Android device. This tutorial is available with any Android device running and OS inlcuding Android 6.0 M, Android 5.0/5.1 Lollipop, Android 4.4 KitKat, etc. Plus, you can find detailed instructions on it. Part I: How to Install USB Driver for original equipment manufacturers (OEMs), like Samsung? Part II: How to Install USB Driver for Android Developer Phones, like Google? Firstly, find the appropriate driver for your device from the OEM drivers table below. Download it and follow the steps below to install or upgrade the driver, based on your version of Windows (Windows 10, Windows 8.1, Windows 8, Windows 7, Windows XP, Windows Vista) and whether you're installing for the first time or upgrading an existing driver. Step 1: Connect your Android-powered device to your computer's USB port. Step 2: Right-click on "Computer" from your desktop or Windows Explorer, and select "Properties". Step 3: Select "Device Manager" in the left pane. Step 4: Locate and expand "Other device" in the list. Step 5: Right-click the device name and select "Update Driver Software". This will launch the Hardware Update Wizard. Step 6: Select "Browse my computer for driver software" and click "Next". Step 8: Click "Next" to install the driver. Step 2: Right-click on "Computer" from your desktop or Windows Explorer, and select "Manage". Step 3: Locate and expand "Android Phone" in the right pane. Step 4: Right-click Android Composite ADB Interface and select "Update Driver". This will launch the Hardware Update Wizard. Step 5: Select "Install from a list or specific location" and click "Next". Step 6: Select "Search for the best driver in these locations"; un-check "Search removable media"; and check "Include this location in the search". Step 8: Click "Next" to upgrade the driver. Step 3: Locate and expand "Other device" in the right pane. Step 4: Right-click the device name and select "Update Driver Software". This will launch the Hardware Update Wizard. Step 5: Select "Browse my computer for driver software" and click "Next". Step 7: Click "Next" to install the driver. Step 3: Select "Device Manager" in the left pane of the Computer Management window. Step 4: Locate and expand "Android Phone" in the right pane. Step 5: Right-click Android Composite ADB Interface and select "Update Driver". This will launch the Hardware Update Wizard. Step 6: Select "Install from a list or specific location" and click "Next". Step 7: Select "Search for the best driver in these locations"; un-check "Search removable media"; and check "Include this location in the search". Step 9: Click "Next" to upgrade the driver. Step 1: Connect your Android-powered device to your computer's USB port. Windows will detect the device and launch the Found New Hardware wizard. Step 2: Select "Locate and install driver software". Step 3: Select "Don't search online". Step 4: Select "I don't have the disk. Show me other options". Step 5: Select "Browse my computer for driver software". Step 6: Click "Browse and locate the USB driver folder". (The Google USB Driver is located in \extras\google\usb_driver\.) As long as you specified the exact location of the installation package, you may leave "Include subfolders" checked or unchecked—it doesn't matter. Step 7: Click "Next". Vista may prompt you to confirm the privilege elevation required for driver installation. Confirm it. Step 8: When Vista asks if you'd like to install the Google ADB Interface device, click "Install" to install the driver. Step 2: Right-click on Computer from your desktop or Windows Explorer, and select "Manage". Step 4: Locate and expand ADB Interface in the right pane. Step 5: Right-click on Android Composite ADB Interface, and select "Update Driver Software". Step 6: When Vista starts updating the driver, a prompt will ask how you want to search for the driver software. Select "Browse my computer for driver software". Step 7: Click "Browse" and locate the USB driver folder. (The Google USB Driver is located in \extras\google\usb_driver\.) As long as you specified the exact location of the installation package, you may leave "Include subfolders" checked or unchecked—it doesn't matter. Step 8: Click "Next". Vista might prompt you to confirm the privilege elevation required for driver installation. Confirm it. Step 9: When Vista asks if you'd like to install the Google ADB Interface device, click "Install" to upgrade the driver. Step 1: Connect your Android-powered device to your computer's USB port. Windows will detect the device and launch the Hardware Update Wizard. Step 2: Select "Install from a list or specific location" and click "Next". Step 3: Select "Search for the best driver in these locations"; un-check "Search removable media"; and check "Include this location in the search". Step 5: Click "Next" to install the driver. Step 2: Right-click on "My Computer" from your desktop or Windows Explorer, and select "Manage". Step 4: Locate and expand Android Phone in the right pane. Note: However, Galaxy Nexus Driver is distributed by Samsung. Step 1: Launch the Android SDK Manager by double-clicking SDK Manager.exe, at the root of your SDK directory. Step 3: Check "Google USB Driver package" and click "Install". Step 4: Proceed to install the package. When done, the driver files are downloaded into the <sdk>\extras\google\usb_driver\ directory. Step 5: Then follow the instructions in Part I to install your USB driver, based on your Windows versions. Once you installed USB driver for your Android device, you can freely connect it to your computer and do other operation, such as perform Android data recovery.